The launch of a sustainable urbanization project, Citizens for the City (www.citizensforthecity.in) was announced by United Technologies Corporation in May 2015 by introducing India’s first ever Neighborhood Improvement Partnership (NIP) Challenge. The challenge received 145 registrations and 86 proposals from across Bengaluru. Out of these, 32 were shortlisted, which followed the declaration of 12 winners by a selection panel. Each of the 12 winners were put through comprehensive reviews, and the projects that required building and zoning permissions were forwarded to the BBMP for approval. The winning projects are expected to be completed within a span of six months. One of the 12 winners includes the community of HSR Layout where Shashidhara, a cyclist and an environmentalist has been actively involved in the NIP Challenge. He talks to us about how it all began with Cycle Day and proceeds to discuss the NIP Challenge project. As quoted, HSR Layout is a well known neighborhood of Bangalore which has seen more than 15 cycle days in the past two years showing intense community commitment. Such initiatives at all levels would involve many challenges in sustaining for a long time. Please tell us about it. From our first cycle day, our biggest challenge was to get local community participate and encourage street closures. Although we were able to get permissions with full support from traffic police, some of the community businesses had concerns with this initiative. Once we proved that this will be a regular event every month, there has been good support. Communication to wider masses is important. Often, we noticed that all seven sectors never got the message of a cycle day event, and we saw poor participation from those who lived little farther from the location. Our vision now is to spread and organize ‘Cycle Day’ in three to four sectors of HSR layout, creating more awareness. 2) The first anniversary of Cycle Day was translated into a larger event called ‘Open streets’ on September 20, 2015. It was the first of its kind in Bangalore which witnessed an entire neighborhood cooperating to block all seven sectors of the layout from traffic. Nevertheless, why does Cycle Day happen on service roads at HSR now? Getting permissions and blocking main streets turn out to be complicated. The local cycling groups also face issues in organizing due to limited budget and marketing efforts. Open streets was centrally planned and organized by the government, which provided much bigger visibility. If we receive stronger support and funding from the government, similar to open streets, each cycle day could be organized at central locations and even on main streets. 3) The Neighborhood Improvement Partnership (NIP) is a collaborative effort by citizens, working alongside public officials, to identify key civic challenges in their neighborhoods, and voluntarily contribute time, energy and resources to tackling them. HSR Layout and Sanjay Nagar have won the NIP ‘citizens for the city’ contest and as a part of that, 23 bicycle parking facilities are expected to be provided at HSR. Could you share the idea behind it? One of the byproducts of Cycle Day was that we have increased the number of active cycle users within our community. Now to sustain this cycling movement and encourage them to use cycle on a daily basis, we needed infrastructure support. One of the first requests from the cyclists was unavailability of cycle parking stands at prominent locations at HSR. So, we have identified 23 such locations where cyclists frequent a lot and are of importance for commercial activities and commute (bus terminals) also. We have presented this study and preliminary report to the NIP team and our project got to be selected. 4) What motives you to take the lead? HSR layout is blessed with wide roads and an active community which cares for the environment. I noticed that first cycle day at Agara Lake had close to 1000 participants and that was the motivation for starting community driven cycle day events at HSR. We had initial discussions with active cyclists and soon formed ‘HSR Cyclists’ group which is now 400 member strong. The best part was the community support received and local businesses sponsored for the events, thereby encouraging their employees also to participate. 5) Has Cycle Day been a catalyst for the NIP contest? Could you tell us how? Cycle Day has provided a platform to attract cyclists and families to come together and experience open streets (not as an event, but as a concept) once a month. I am sure this has helped motivate many residents to purchase cycles, and experience riding within HSR layout. Since infrastructure and cycling community growth goes hand-in-hand, NIP contest helps with this process. 6) What kind of organizations and people have been involved in the process? How much time was taken throughout? We have a group of 20 dedicated volunteers and they come from various backgrounds. Many of them are IT employees among which some started cycling only after being continuously a part of Cycle Day. Our first group meeting was held in August 2014 and it took us almost 30 days to plan the first Cycle Day. After establishing a template and encouraging local business and hospitals to support this, it has been a smooth experience. Our local sponsors have supported all Cycle Days and one of them also bought tandem cycles for the event. 7) With a futuristic perspective, what do you think are the challenges in organizing Cycle Day? What support do you require? I think some logistics challenges still exist, with respect to rental cycles and stage preparation. Also spreading the word more within the locality would be great other than through social media. Did Open Streets at MG Road yield results? The expected results? Aerial view of MG road during Open Streets. Contrast in space usage could be seen. The first time MG road turned vehicle-free was on February 21st, 2016 when cars and bikes were replaced by people strolling across the 700m stretch from dawn to dusk. While ‘Open Streets’ is an initiative to promote cycling, walking and the use of public transport, the 12 hour traffic-free stretch along with Rangoli Metro art centre catered to many artists, performers, food businesses, handicraft businesses, etc. The rendition of a ‘carnival’ feel in the commercial zone has made a positive long-lasting mark in the minds of Bengalureans about Open Streets. In contrast to it, the initiative was implemented for the first time at HSR Layout, a well known residential neighborhood of Bengaluru in September 2015. The first anniversary of Cycle Day, a BCOS (Bangalore Coalition for Open Streets) initiative, which regularly finds its place in different localities on Sundays was translated into ‘Open Streets’ for the first time at HSR Layout. While the local RWA’s took the onus of outreach and awareness tasks within HSR, the second Open Streets was publicized to an unimaginable extent across Bengaluru and other parts of the country as well. The sustained efforts of conducting Cycle Day helped the government to scale up to Open Streets, a larger initiative at HSR and MG road. The event was organized and coordinated by DULT (Directorate of Urban Land Transport), Tourism Department, BMRCL (Bangalore Metro Rail Corporation Limited), BMTC (Bangalore Metropolitan Transport Corporation), Bangalore City Police, Bangalore Traffic Police, BESCOM (Bangalore Electricity Supply Company Ltd), BWSSB (Bangalore Water Supply and Sewerage Board), Karnataka Pollution Control Board, Karnataka Forest Department and BCOS Cycle Day. A survey was also conducted by ESAF (Evangelical Social Action Forum) Bangalore during Open Streets regarding gender ratio, age groups, distance travelled, public transport usage and few other aspects. This yielded positive results which directly showcased 21% of the survey participants needing more public spaces suitable for people to explore on foot with family and friends. Survey conducted by ESAF Bangalore. Maximum presence was showed by people between the age groups 35 and 60, with the overall male-female ratio being 11:9. Also, the highest percentage (42%) of people travelled a distance of more than 10 kilometres to reach the event destination. With promotion of sustainable transport being one of the major ideas of the initiative, 100 prizes – 50 gift coupons worth Rs. 500 and 50 special commemorative cards preloaded with currency worth Rs. 500 were given out to 100 different lucky draw winners who commuted to the destination by BMTC buses. The implementation of metro system at Bangalore- ‘Namma Metro’ handled by BMRCL (Bangalore Metro Rail Corporation Limited) was initiated in the year 2011. Following which, after five years, the city has two lines of metro functioning currently. In order to expand the ridership of metro, the agency has been taking necessary steps, of which OMG is one. As one of the stakeholders of ‘OMG’, BMRCL extended metro services till 11pm which saw increased ridership on the day due to the central location of MG road metro station at the event destination. The swipe out at MG road metro station during OMG is almost 3 times the swipe out observed on another Sunday. BMTC (Bangalore Metropolitan Transport Corporation), one of the most well known bus transport systems of India plies buses within the city. It is an important agency which does not fail to participate in initiatives like Open Streets, thereby showing it’s concern for the environment and people which form the city. “On February 21st, BMTC had provided 50 schedules comprising of 11 routes and 933 trips with buses connecting major bus stations and metro stations compulsorily via Anil Kumble circle or MG Road metro station. Total distance covered by the buses during OMG was 8899 kilometres. RBANMS ground was exclusively allotted for parking and feeder buses were deployed to and from RBANMS grounds via MG Road metro station. We also provided late night services when five schedules of buses operated via MG road till 11pm. While this event was organized to promote sustainable modes of transport as well, it was not addressed completely by the public leading to a loss on our side.” – A BMTC official said. The above figures show that better patronage of BMTC services was expected than what was observed. The below bar graph conveys that almost 31% of the survey participants used public transport (Bus & Metro) and 40% used private modes of commute (cars and bikes). Therefore, 48% of them used sustainable modes of transport (Walking, cycling, bus, metro). On the contrary, 98% of the survey participants showed their support for sustainable transport, leaving behind the remaining 2%. The paradox of the scenario lies in people encouraging sustainable modes of transport, yet flocking the event with their private vehicles parked right at the doorstep of the venue. Therefore, the efforts-demanding ‘Open Streets’ urges the responsible residents of the city to turn the usage of sustainable modes of transport an inveterate aspect of their lives, failing which the whole idea will repeatedly remain futile, even if organized monthly as per the survey. ‘Open Streets’ wants you to be open-minded, leaving aside motorized transport for short distant commutes and join the sustainable transport club! The urban population of the country’s past failed to significantly address issues of traffic congestion, pollution levels and environmental degradation, because of which the solutions for the same are increasingly promoted and highly debated today. Usage of sustainable modes of transport being one of the most invaluable methods solving multiple urban and transport issues, involves extensive participation of the citizens and implication in our day-to-day lives. The Department of Urban Land Transport (Karnataka) has been striving to be the change by creating a twist in the mindsets of people about the usage of long-lasting sustainable modes of transport. The Department has been anchoring ‘Cycle Day’ which has found its place in more than 15 neighborhoods of Bengaluru with every Cycle Day witnessing new community partners joining to address the larger urban issues. However, the initiative is at its soaring pace to reach localities which demand to be revivified with bicycle wheels and other non-motorized transport facilities. Other than community partners, there have been individuals with a strong inclination towards sustainability taking necessary steps to transform their places of living into bicycle neighborhoods. The following video is a documentation of the preparation, coordination and involvement that went into organizing Cycle Day at JP Nagar 7th Phase on February 28, 2015. ‘OMG’ is Open Streets MG Road ! The Open Streets initiative by Directorate of Urban Land Transport (DULT) aims to create awareness in the general public about the benefits of using public transport, cycling, walking and the positive effect it has on their lives and the overall ‘health’ of the city. OMG – Open Streets MG Road is going to revive the long-lost charm of the Boulevard of Bengaluru city – MG Road on Feb 21st, 2016. In the video, Ms. V. Manjula, IAS, Commissioner, DULT briefs about everything that you need to know about OMG. Did ‘Open Streets’ at HSR Make Any Difference at all? Did ‘Open Streets’ at HSR Layout make any difference? Probably, yes. A partial twist in the mindsets of people! Know Seven different views from seven categories of people.. The concept of Open Streets executed on September 20, 2015 at HSR Layout has recorded a ‘MIXED’ impact in the neighborhood after four months of its implementation. Although a forgotten concept, the abstraction turned into reality in India when the state government of Karnataka came forward to pilot ‘Open Streets’ in all seven sectors of HSR Layout. The initiative which promotes the use of public transport, cycling and walking restricted the movement of all motorized personal vehicles such as cars, motorbikes, autos and taxis, etc. within the locality. Public transport facilities like buses were provided by BMTC which plied in the vehicle free zone of the neighborhood to help locals move within and outside. The collaborative efforts demanded intense coordination and involvement of different organizations and groups like DULT (Directorate of Urban Land Transport), BBMP, Bangalore Traffic Police, BMTC, BMRCL, Bangalore Police Department, Department of Forest Ecology and Environment, Department of Tourism, Karnataka State Pollution Control Board, HSR Cyclists, HSR RWA (Residents Welfare Association), BCOS (Bangalore Coalition for Open Streets), etc. HSR Layout being one of the most vibrant and progressive neighborhoods in Bangalore was chosen for the pilot attempt because of the presence of numerous dedicated citizen groups with a long-term commitment and potential to promote the use of sustainable modes of transport. The immediate impact about the bus services showed positive signs of awareness spread to the residents about the usage of public transport. But, the long term impact created during the last four months post implementation was studied to conclude the possibilities of replicating the same in other neighborhoods as well. “The coordination between different civic agencies like BMTC, Bangalore Traffic Police, Bangalore Law & Order Police, etc. deserves immense appreciation. Even though there was lack of adequate prior communication within the layout and the neighborhood, people enthusiastically participated in different activities and supported the concept of using public transport and other sustainable modes of transport to commute. It was observed by the volunteers and civic agencies that a few educated citizens of the neighborhood did not cooperate with the initiative of the Government and created avoidable ugly incidents. Post event, there were four feeder routes engaged within the layout. Based on the feedback from BMTC drivers and officials about the loss they were incurring, the HSR RWAs proposed to the BMTC workable routes which connected the layout till Majestic also. Mere lack of communication and aggressive campaigning has led to a situation where, out of a population of 40,000, only 50 to 60% are interested in using sustainable modes of transport now. Also, the entire heterogeneous group of people at HSR Layout would be well accepting if BBMP in conjunction with the Traffic Police and DULT could make pedestrian pathways available and allow the footpaths to flourish, by taking stringent actions. I would suggest the event to be conducted on a regular basis like once in three or four months to create consistent awareness amongst people. On the whole, approximately 60 to 70% of the residents felt it was an excellent initiative and we are now mentally prepared as to what could be expected on such days.” – Brigadier Murthy (Retd), an Army veteran and a civic activist. “During Open Streets, nine feeder and three trunk routes were facilitated through 52 buses with an interval of 5 to 10 minutes between two bus stoppages. BMTC Day Passes were provided at subsidized promotional rates, which were valid within HSR Layout and other areas in Bangalore on the day of the event. For almost one month after the event, four feeder routes which were active led to monetary loss due to insufficient usage of buses. One feeder (FDR) bus which runs for 200 kilometres per day bears an expense of 44 rupees per kilometre and in turn gains eight to nine rupees per kilometer amounting to a loss of around 34 rupees per kilometre. Considering the loss and the suggestion by HSR RWAs, only 10 schedules (340A & 348M) of FDR buses are currently being operated from Parangipalya to Majestic and vice versa. Two more schedules (362) connecting to Shivajinagar are also added.” –a BMTC official said. “Through Open Streets in HSR Layout, we could sensitize local people about the use of public transport. But, on a general note, only RWA’s take major interest and show active participation. Common people at large fail to get involved and so we go at loss. Anyhow, we at BMTC are streamlining operations and depending on the run, re-routing will be done after regular valuations. We are confident of achieving maximum use of public transport in the city and it definitely will take time.” – Renukeshwara, Chief Traffic Manager (Operations), BMTC. “As a responsible citizen, I am aware of the environmental and social hazards like pollution and traffic congestion. But I have been surviving on the driving school business for the last ten years. After the event, even though there is no significant change in the number of students, I am sure the awareness about the use of non motorized transport will bring about a change.” – A driving school owner said. Businesses like Grofers and Flipkart positively adapted to cycling for delivery purposes within the layout. “It was fun to go around cycling to deliver items within the streets of HSR. Moreover, the delivery boys who went cycling were paid more than the usual on that day. Our business was not affected.” – Suresh, a Grofers employee said. The common response received from the senior citizens of HSR Layout was that the entire locality turned out to be very lively and delightful on the day of the event. According to them, the concept of Open Streets which created a mixed impact in HSR Layout need to be enforced in every locality on a regular basis enabling the pedestrians and cyclists to reclaim their share of road space in the city. Are we ready for the next ‘Open Streets’ at MG Road? In a typical week with favorable weather conditions, how many days do you use bicycle as your primary means of transport between home and work/school? Karthik is a citizen who prefers to choose any mode of transport which minimizes cost and time investments, yet provide comfort. He assumes to be provided with car-supportive environments all across the metro or cosmopolitan city he dwells in. Unfortunately, it is not true. The inclination towards factors like cost, time and comfort turns him oblivious to environmental hazards and social discomforts. Just like any other resident, he complaints of traffic congestion, improper driving sense among public, disobeyed traffic rules, polluted air, global warming, depletion of ozone layer and so on. But, he fails to realize that he is a small but mattering part of the whole system he complaints about! With the increasing awareness of low-carbon economy and low-carbon city, Karthik reflects on the environmental problems in the transportation field, thereby changing for the good. He addresses the issues by finding alternative modes of commute in place of the daily long car drives to and from work, his average trip distance (from point A to point B) being 5 kms a day. He understands that commuting by bicycle proves double advantageous (self and society) over any other mode of transport. But, the existence of other complications to bicycling and other related factors are already in place. – Low levels of car traffic on neighborhood streets. Most importantly, close proximity to jobs is an important predictor in how frequently one can make that commute trip by bicycle. Somehow, Karthik interprets that the above mentioned factors relate to demand of supporting infrastructure and better planning. But that’s not an excuse! Above all, he sternly believes that it is the ‘travel attitude’ of an individual which encourages him to bicycle. It has also been proved that bicyclists in particular derive great satisfaction from many aspects of their commute, in spite of the fact that they are vulnerable to day-to-day changes in weather or varying travel needs. This is not just the story of Karthik, but any socially responsible individual who prefers to cycle to work! Note: Karthik is an imaginary character created to keep the deliberation on cycling in the form of a story. Levinson, D., Schoner, J., Cao, X., 2014. Catalysts and Magnets Built Environment Effects on Bicycle Commuting. Transport Research Board, 2, pp.1-21. Cycle Day gets themed for the first time! While ‘Cycle Day’ is a theme by itself, the youth brigade of Coffee Board Layout strike more fun and value to it. The 107th Cycle day in Bangalore was themed ‘Masti ki Pathshala’ and hosted by the Rotaract Club, Presidency College in conjunction with the residents of the layout in Nagavara. The theme created an enhanced aura of joy where all cycle enthusiasts obliged to responsible warm up sessions followed by three rounds of cycle rides across the beautiful avenues of Nagavara. 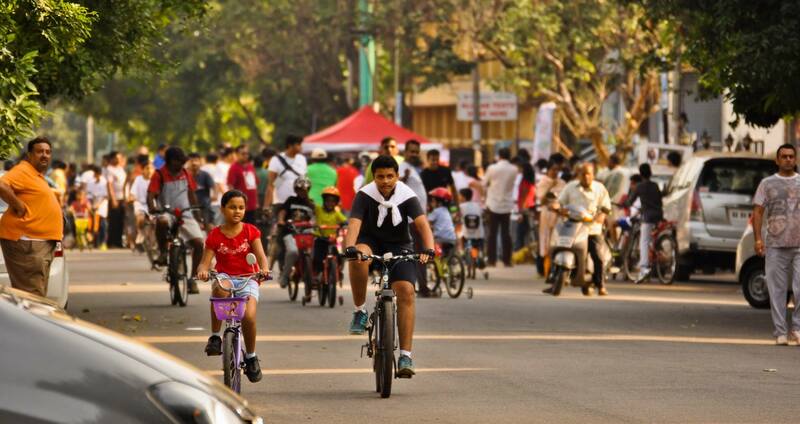 Additionally, the concept of Open Streets fused with Cycle Day helped the neighborhood experience the feel of openness and enjoy various games like lagori, badminton, chess, ludo etc. TWIST IN THE MINDSETS: The spirit of cycling wants to experienced by all age groups. Many guests including RJ Raj seemed to have a lot of fun in the lively atmosphere , participating in his favorite games; and Rtr. Vinod Sir was noticed cycling from RMV to the venue along with Rtr Mohan, Rtr Anita and Lalitha. FOR A CAUSE: The residents of Coffee Board Layout showcasing their social responsibility. UNITED WE CYCLE: The event instills a sense of community among the people. THE STREET BELONGS TO ALL: Kids make chess moves right across the streets of the neighborhood. ENTHU MUSICIANS: College going students perform in front of the entire locality. The event culminated with a splendid musical performance by Ankur Tripathi and his band members consisting of Shubham and Rohit. Also, Manav Seth (President Rotaract Club) dedicated a song to the Rotaractors team for the first successful event in Nagavara and invited the crowd for the next event scheduled to be held on the 14th of February 2016 which happens to be Valentine’s day. Irrespective of age and possession of cycles, the community came together to socialize and promote cycling, keeping in mind the whole cause behind the initiative. BCOS welcomes aboard our very first university partner Presidency College (Rotaract club), Hebbal who will be hosting Cycle Day at Nagavara (Coffee Board Layout) on the second Sunday of February and March. This community partner in Nagavara has been the youngest group of people BCOS have worked with till date. ‘Cycling’ – The New Buzz in Bangalore! ‘Cycling is a joy and faster than many other modes of transport, depending on the time of day. It clears the head.’ – David Byrne. A Sunday well spent brings a week’s content. Sunday mornings in Bangalore are not anymore the same lazy ones. Many Bangalorians have taken up cycling for personal and social reasons. The gradual increase in the number of neighborhoods organizing Cycle Day is expected to pave way for a traffic-free Bangalore in the long run. Topping the list is Cubbon Park which witnesses Cycle Day presenting free cycle rentals from 6 am to 6 pm on every Sunday. Other active neighborhoods are Sanjay Nagar and HSR Layout which conduct Cycle Day on the first and third Sundays of every month respectively. The residents are attempting to make a difference by transforming their localities into motor-free zones for almost four hours in the mornings. A standard motor-free zone follows the concept of ‘Open Streets,’ permitting cycling and walking in the precinct. Bangalore has already seen 104 Cycle Days till date across different neighborhoods. This huge success has been building up interest in the organizers to extend the event to every nook and corner of the city and also beyond Bangalore. The Bangalore crowd now is gradually demanding a good cycling infrastructure which ensures safety and security for cyclists on the roads. This relates to sustainable way of living and could take Bangalore to next levels of cycling. Promoting cycling and the concept of ‘Open Streets’ shall ensure carbon free roads and make cycling infrastructure implementation a dream come true. You know it’s winter when the reluctance to get out of bed in the morning keeps ascending within. It feels good to snuggle deep into the bed covers on Sunday mornings but the residents of HSR Layout prove the opposite. Cycle Day has become a monthly event in the neighborhood for the past one year, since its inception in 2013. ACTIVE WINTER MORNINGS: Christmas winter break gets more children to cycle everyday. The event instills a sense of fitness into the minds of children. The 101st Cycle Day organized at HSR Layout saw cycling enthusiasts not only from Sector 3, but also from other sectors of the neighborhood. HSR Cyclist Shashidhar said, “This is HSR Layout’s 16th Cycle Day (December 20, 2015) and the last one for the year 2015.” He also said that the neighborhood which has won NIP ‘citizens for the city’ contest will avail 20 cycle parking facilities across HSR Layout funded by United Technologies. EARLY MORNING CONVERSATIONS AND CYCLE RIDES: Residents belonging to the same locality get to meet during mornings to cherish their friendship by participating in activities together. Other than cycle rides, activities like street games, group karate performances and garbage disposal lessons saw immense participation from children and adults. EARLY TO RISE: Winter mornings don’t stop children from participating in Cycle Days. Groups of children aged between 6 and 13 impressed the onlookers with karate moves. THE AGED THE BETTER: HSR Layout’s consistent cycling enthusiasts, including Rao Ganesh of the Police Department. The event anchored by the Directorate of Urban Land Transport (DULT) is an initiative by the Bangalore Coalition for Open Spaces (BCOS). The event is partnered and organized by HSR Cyclists at HSR Layout, Government bodies like Bangalore Traffic Police, BBMP and other organizations. As of today, Cycle Day has reached 17 neighborhoods in the city of Bengaluru. Initiatives like Cycle Day and Open Streets create awareness about the need to shift to Sustainable transport and also facilitate to bridge the gap between Government agencies and local communities to improve neighborhood infrastructure. Sahakara Nagar Says “Once More” to Cycle Day! Quite impressed with the concept of Cycle Day, Sahakara Nagar brought Cycle Day for the second time in the locality, this Sunday. The Sahakara Nagar Women Welfare Association chose to be the local partners for the event at the neighborhood. One could find the roads closed to traffic and bikers hitting the streets pedaling for a cause. Interesting post-ride events included Zumba dance, self defense techniques and so on. Nostalgia filled the air when aged participants took part in different street games. Sahakara Nagar’s potential to give its word for sustainable modes of transport deserves appreciation and instigates a sense of well being and healthy living, thereby making Bangalore and the country a better place to live in.